Cornelius Gerling at Edmiston & Company tells me there's a €800,000 price drop on his listing for sale, the 33m motor yacht Regine. 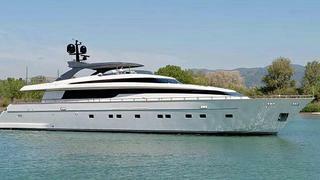 Launched in May 2012 by the Sanlorenzo shipyard, Regine was designed by the the yard's in-house team and is the latest in the popular SL108 series. An interior by Della Role accommodates 10 guests in a full beam owner's stateroom with limestone flooring and four further guest cabins. Her interior is nautical chic, with white limed teak floors and walls, and modern furniture throughout. She is powered by twin 1,940kW MTU engines giving a top speed of 26 knots and a cruising speed of 22 knots. Cornelius says Regine has most of her warranty work done or underway. Lying in the South of France, Regine is down from €8.29 million to €7.49 million.